Ok so this is my story. My Parents and my brother moved to Inverness. Close to Orlando. I flew down to visit meet a bunch of people at a party and they took me down the Rainbow springs river the following day. We floated for four hours in huge inner tubes. 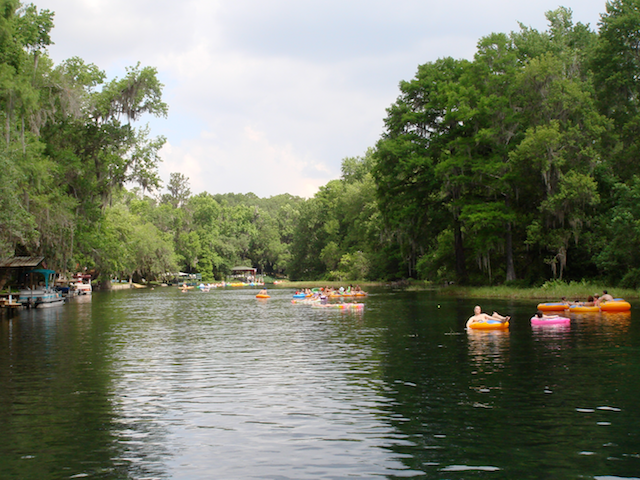 It was a party along with 100’s of other people on the rainbow river that day. It was truly an amazing experience. I moved from California to Florida the next week and never regretted it. The Rainbow river is also where I went for my second scuba diving adventure. We floated from 5-25 feet of crystal clear river water down stream for about 45 minutes. We stopped off at an under water cave where the spring was coming from. There was an abundance of underwater life including Gar Fish, Alligators, Fresh Water Turtles, Snapping Turtles and Soft Shell Turtles. Important NOTICE for those interested in tubing the Rainbow River. The K. P. Hole has very limited parking. Once the parking lot is full the park closes until parking spaces open up. If you park on the street or on private property you will be ticketed and your vehicle towed. On Friday, Saturday and Sunday the parking lots are usually full by 10:00. If you are coming to The Rainbow River to tube down the river a better alternative to the K. P. Hole is the new State Park facility on the east side of the river. The State Park’s new Tubing Entrance to the park is located at 10830 S.W. 180th Ave Rd, Dunnellon, FL 34432 on the east side of the river. From here you can rent a tube, ride the tram up river and then float back to your point of origin, not needing a second vehicle. The float trip is approximately one and one-half hours long, depending on wind. And after floating down the river you can show your receipt for free admission to the headsprings area of the park at the US 41 entrance for a day of picnicking, nature study, swimming and family fun. $11.00 plus tax per person, if you have your own tube, the tube must be less than 60” in diameter. Using the State’s new tubing facility you will enter the river upriver from the river from the K. P. Hole. Your tubing trip will be about 2 hours long if you use the State’s take out on the east side of the river. If you leave from the K. P. Hole the tubing trip will be about 4 hours to the State Road 484 bridge take out. If you use the State’s new tubing facility and decide you would like a longer day on the river, once you finish the 2 hour trip, you exit the river and then take the tram back up river for another 2 hour float. You will need to pay for the second tubing trip. There are several advantages to doing the “double dip”. Your vehicle is located at the State’s take out facility along with restrooms and other facilities. If some in your group do not want to spend another 2 hours on the river they are not forced to continue. If the weather is bad you are not stuck on the river in a lightning storm. The first 2 hours of the float is on the best part of the river: the water is clearer, cleaner and the scenery is much better. If you want to take a break and have a bite to eat, your vehicle is right there for you to access your drinks and food. The Marion County Park known as The K.P. 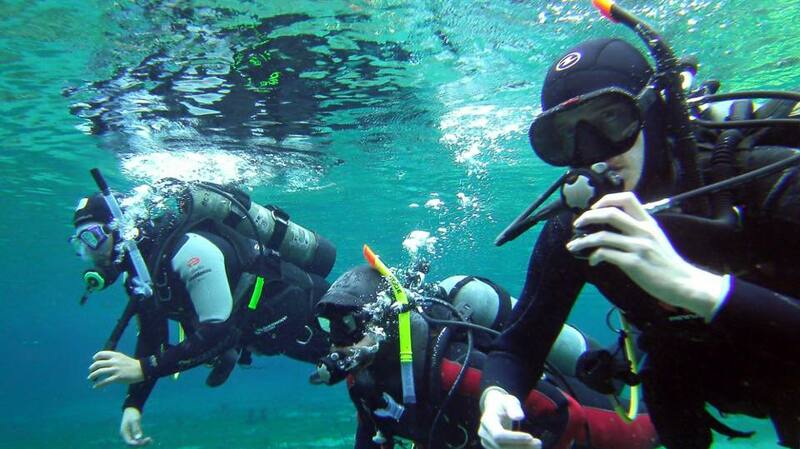 Hole is located about 1.5 miles down river from the Rainbow Springs State Park and offers limited public facilities for swimming, cooking out, tub rentals, canoe rentals, dive flag rentals, restroom facilities, etc. Hours of Operation: Summer: 8 a.m. – 8 p.m. Winter: 8 a.m. – 5 p.m. Tubing and Shuttle Services are available April 1st through September 30th. April 1st to May 8th all floaters must be in the Park and on the water by noon. Between May 9th to September 30th, tube and shuttle rentals will cease at 12:45 PM and you must be on the river no later than 1:00. If you bring your own tube and don’t need the shuttle you must in the water and floating down the river by 1:45. These rules are necessary because many folks don’t make the exit point by dark or before the last shuttle run. Because there are many boaters on the river the County has restricted tubes and floats to no bigger than 60 inches.